I’m a fan of Maître Parfumeur et Gantier; I wear, or have worn: Route du Vetiver (my favorite vetiver fragrance), Jardin du Nil, Parfum d’Habit, Iris Bleu Gris, and — a top compliment-getter — Baïmé. I’ve been looking forward to Bois de Turquie’s release and wondering what makes wood smell Turkish. Bois de Turquie contains bergamot, tangerine, orange blossom, Laurus nobilis, geranium, iris, jasmine, ginger, cinnamon, sandalwood, patchouli, myrrh and frankincense. Bois de Turquie is smooth and semi-sweet on application; its citrus notes, both fruity and floral, are warm, not cold or bracing. The mid-development of Bois de Turquie smells a bit herbal and “leafy” (bay leaf and geranium become apparent). A powdery iris-jasmine accord follows the leafy stage and gives Bois de Turquie a quiet, lazy vibe; on me, this floral accord lasts longest. As it develops on skin, Bois de Turquie’s floral accord softens and merges with mildest incense and sweet resinous notes. Bois de Turquie does not conjure up Turkey for me as Serge Lutens Fumerie Turque does; there is no overdose (or adventurous use) of an ingredient, and there are no unfamiliar notes/accords present. Smelling Bois de Turquie for the first time was like encountering someone I had already met…long ago, or noticing someone with a striking resemblance to a friend. It took me a day before one word sprang to my mind: DZONGKHA, but when I tested my “theory” (wore the scents side by side) I noticed differences between the fragrances — L'Artisan's Dzongkha is sharper, livelier, and has a clearer focus (it also smells more masculine with its leather, incense and vetiver notes). I would describe the two fragrances as sister (Bois de Turquie) and brother (Dzongkha), with iris as a prominent shared “feature.” The two fragrances complement each other and I like them both. Maître Parfumeur et Gantier’s take on Turkish wood(s) is ethereal, comforting and familiar. Maître Parfumeur et Gantier Bois de Turquie is a unisex fragrance; its lasting power and sillage are average. It is available in 100 ml Eau de Toilette for $112. For buying information, see the listing for Maître Parfumeur et Gantier under Perfume Houses. 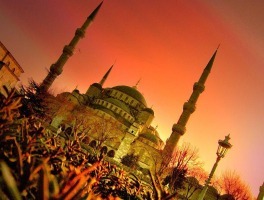 Note: first image is Sultanahmet Mosque Oblique Shot...by Kıvanç at Flickr; some rights reserved. This sounds like a lovely fragrance, I'll have to try it! Kevin, I'm testing this one today, and liking it a lot. It's more gourmand than I expected, and less woody. In fact, I can't detect any wood at all, but if Turkey smells like this then I should think of visiting! VG: the woods/resiny notes come in the extreme dry-down for me; as for Turkey — I'd say this interpretation is more “mosque” or “palace” than street market. Both fragrances sound very worthy to be explored. I am very fond of fragrances with prominent woods in them. Does Bois de Turquie contain cedarwood or cypress, or both maybe? Bayleaf also adds something good to a scent. Time to email or phone for samples. Hi, MW: I don't smell cedarwood/cypress myself. Nice review, Kevin, and it does sound like a nice scent. I finally got some Dzongka recently and I really love it, so it would be interesting to compare. I've been meaning to tell you that I really enjoyed the sample of Baïme that you sent me, but found it SO short-lived. Haven't gotten to many of the other MPGs you sent me (it will seriously take me months to make any headway). I would probably buy some Baïme if it lasted a little longer. Joe mon ami: did you put on the ENTIRE Baime sample? It's one of my 10 spray scents..and when I do that it lasts, really, over 10 hours on me and others can smell it. I REALLY like Dzongkha and prefer it to Bois de Turquie…BdT is softer, lighter in feel. I currently have the 2 hand test goin on…MPG Turquie…nice but oh so light…DZONKA…way more alive…but sorry to say I hate it! While on a fragrance purchasing trip, a bottle of DZONKA wound up at home in “the collection” . It smelled out of this world at Barney's, but never wound up in full rotation. As a matter of fact, this bottle wound up Waaaaay back in the line. I've tried every now and then to give it a chance with new nose perspective, but to no avail could I succumb to the love that DZONKA gets everywhere. Well thru out my long babbling here…washed off DZONKA…( I get mega celery soup)…MPGT still smells lightly pleasant(would love if stronger)…and MPG Baime entire sample soak (thanks K) on wrist is Fabu! I've always been a fan of MPG scents. I liked their passiflore, although the sillage on me was enormous. This sounds like a must try, those herbal scents do me in every time. Thanks for a great review. Strange that nobody talks on the web about “Ambre Doré” the limited MPG edition. A very good but expensive Amber. I will try BdT as soon as possible. bklyn fragrance lover: glad you like Baime…wish I were wearing it today but am trying out a fragrance that smells of bathroom tissue! Benoit: unfortunately I'm not familiar with Ambre Dore…did it come and go quickly? It's not on MPG's website. I only find “Ambre Doré” in the paris official shop. No other communication around this amber elsewhere (even on the web). From the SA it was a limited edition done firstly by MPG for a rich client. It is sold in the classical woman bottle of MPG in a special yellow bag. I should have poured the WHOLE sample on, but I did want to save some for another day. I'm sure that's the problem (and really, the problem with 1ml or 1.5ml sample sizes in general). I'm sure it is a marvelous 10-spritz scent. LMAO! Now what fragrance might that be? other people like me are attracted by perfume which can desappear … and a limited edition by MPG is really a target for my weak mind. The Amber is good there is no pb about it. I just received my BdT sample from Aedes. I've had it on for a few hours, and at first it reminded me very much of Guerlain's Aqua Allegoria Winter Delice. The spices are very sweet on me, almost like cola (lemon, cinnamon, and vanilla). The incense is also there in a very light and pleasant way. I loved your sister BdT/brother Dzongkha comparison! Fragrances always turn sweet with my chemistry, which is why fragrances marketed toward men (like my absolute favorites: Dzongkha and YSL's M7) don't make me smell masculine. Sadly, the BdT flowers and woods/resins didn't show up at all on me, unlike with Dzongkha where they are so richly prominent. In the dry down, BdT is strongly resembling L'Artisan's Tea for Two — warm, milky incense and spice. I just got a small decant of Bois de Turquie on clearance at The Perfumed Court, and my first thought upon trying it was that it’s almost a dead ringer for Diptyque Volutes (or Volutes for it, since BdT was here first), though BdT is slightly more floral, and Volutes has the tobacco note. The iris note smells almost exactly the same in both to me. Normally I have a hard time with iris because it gets really soapy on my skin, but it those two it doesn’t read that way at all, while Dzonkha is a giant soap-fest. I don’t get the incense in Dzonkha at all.. all I smell is soapy iris and vetiver, like somebody’s giving vetiver roots a bath.